Traction Kit is a Mechanical Pulling Device intended to apply uniform and controlled traction (Pull) to the lumbar, sacral, thoracic, and cervical areas of the vertebral column. For applying traction to Lumbar, Sacral, Thoracic part of the spine, use Pelvic Traction Belt along with Traction Kit. 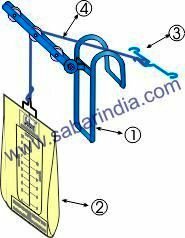 For Applying traction to Cervical part of the spine, Use Head Halter along with Traction Kit. Use Pelvic Traction belt in effective and practical treatment of lumbo-sacral spondylosis and for patient suffering from lower back pain. Use to give traction in lumbar and sacroiliac region for normal alignment of the vertebrae and restore normalcy. 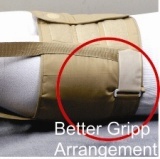 Pelvic Traction Belt is made from foam padded durable cotton cloth, for patient’s comfort. Contoured shape with special ‘V’ fitting with Velcro arrangements at both the sides at pelvic region for better grip. Hook and Loop closures for easy adjustment and removal. Two sturdy straps with heavy ‘D’ rings help to give traction. Note : To determine the correct size, measure the circumference of waist in cms. 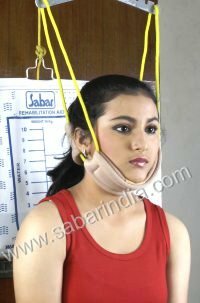 Use Head Halter in case of chronic neck pain from Cervical Spondylosis, Disk Prolapse, Whiplash Injury, Torticollis. Helps relieve muscle spasms in the neck and shoulders, and to relieve the pain of pinched nerves in the cervical region. Sewn with best quality cotton stockinette along with foam as padding for effective, controlled and comfortable traction application. Required length of Nylon Braided Cord. Apply Controlled and uniform traction to the lumbar, sacral, thoracic, and cervical areas of the vertebral column. An effective and safest way to apply traction force. Sturdy Metal design for a long life and multiple use. Ergonomic design for easy use. Can be conveniently used at homes or hospitals.